Fundraising continued into the autumn with a Big Raffle to the Big Apple, where return flight tickets to New York kindly donated by British Airways were raffled to raise funds. Colleagues from Swanwick also went ‘NUTS’ for Aerobility, tackling the largest assault course in the UK. The NUTS challenge included sliding down ropes, climbing cargo nets, swimming through lakes and diving through tunnels along the 7km course. NATS people also took on an Olympic sized task when they completed a fitness challenge. 70 employees battled it out in two teams with the aim of running the equivalent distance from NATS Corporate Centre to the Olympic Stadium in London on treadmills. After an incredible year of full-on fundraising, NATS beat their fundraising target! 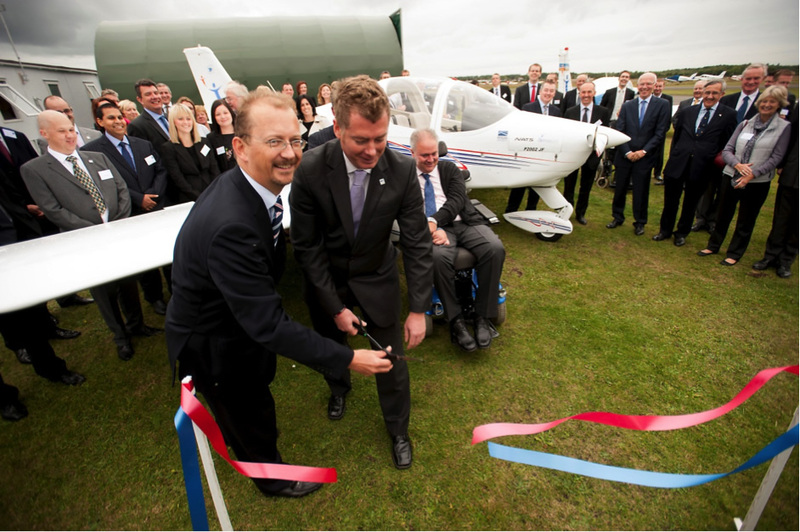 Richard Deakin and Prospect’s Aerobility lead Chris Edwards cutting the ribbon. In September, after an incredible year of dedicated fundraising from employees, NATS smashed their fundraising target of £100,000 by raising £155,000 for Aerobility. NATS concluded the fundraising with a handover event at Blackbushe Airport. An aircraft was jointly presented by NATS and Prospect ATCOs' Branch, in front of invited guests and dignitaries. The presentation represented the culmination of a year's impressive fundraising from across NATS. “We are incredibly grateful to NATS for their support over the past year. Without a doubt this has been one of the biggest single influences on the charity, allowing us to invest in a new aircraft with all the benefits that brings. 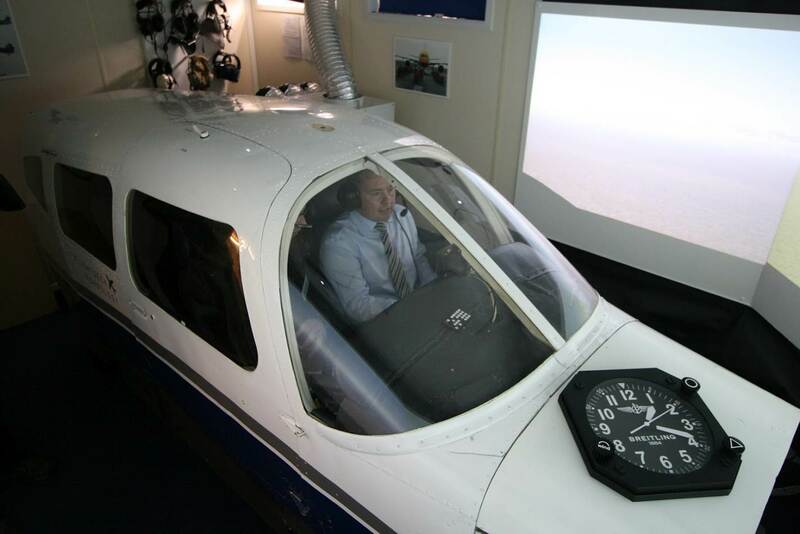 In October 2012 Aerobility had double reason to celebrate, not only did they take delivery of a brand new aircraft, they also completed a round-the-world simulator flight challenge, where NATS people and Prospect ATCOs’ Branch played a central role. The team of pilots taking part in the epic relay flight included legendary Apollo 11 astronaut Buzz Aldrin, comic Joe Pasquale, presenter Chris Evans, Willie Walsh CEO IAG, as well as many employees from around NATS. NATS people played a leading role in the behind-the scenes efforts to make the record attempt run smoothly. Volunteers from Prospect ATCOs’ Branch and their families were on hand to ensure that navigation was conducted appropriately as required by Guinness Rules, and that time keeping was accurate. They also provided basic air traffic control and prepared for simulations arrivals and departures. Members from NATS Corporate Communications team were also on hand to help Aerobility manage the media interest. Prospect’s Aaron Curtis keeps a close eye on the progress during the challenge. Richard Deakin and Richard Churchill-Coleman complete their leg of the flight. 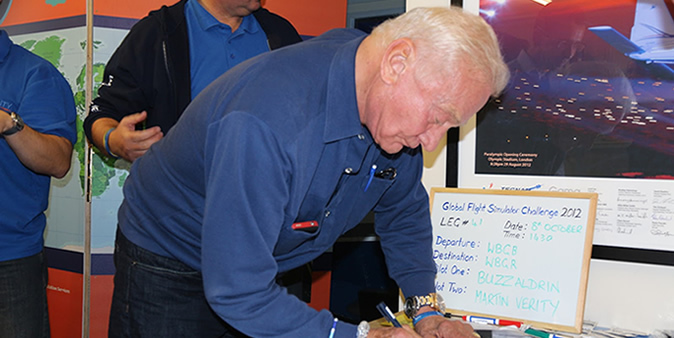 Members of Propsect ATCOs’ Branch who helped to invigilate the challenge, with Buzz Aldrin. After travelling over 22,000 nautical miles, with over 200 hours of flying, Aerobility became the new Guinness World Record holders for the longest flight simulation. “What an inspirational 10 days! And, without doubt, this challenge would not have been possible without the tremendous support of Paul Winstanley and his dedicated team of ATCOs and volunteers. These guys worked tirelessly to ensure we complied with the strict guidelines issued to us by Guinness World Records, and we can’t thank them enough. Simon Waterfall, Aerobility Volunteer Project Manager.